The International Solidarity Movement is staging a week long campaign in Beit Jalla to stop indescriminate shelling of family households. 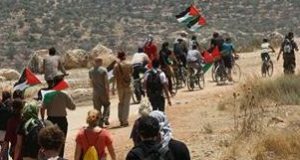 On Monday the 24th, a group of Internationals organized by the International Solidarity Movement have placed themselves within the line of fire between settler and Israeli forces and the residents of Beit Jalla. Beit Jalla is located South of Jerusalem, near the settlement of Gilo and the city of Bethlehem. The activists chose to focus on Beit Jalla due to increased military activity in the area. A rotating group of about 20 Internationals from the U.S., Canada and Europe have launched a week long campaign. They are staying at area houses of families most likely to face retaliatory gunfire and shelling from military bases stationed beneath Gilo. Their message is- if you fire at Beit Jalla, you fire at us. Activists from the International Solidarity Movement were invited to the area by families who were concerned for their own well being in light of recent attacks by the Israeli Defense Force (IDF). 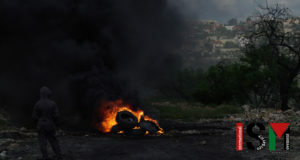 Last week, the IDF launched an attack in the city of Bethlehem against suspected Hamas members believed to be carrying out a bombing attack against the Maccabiah Games in Jerusalem. Gunships fired missiles at a car used by the suspects, and four people were killed, including two bystanders. 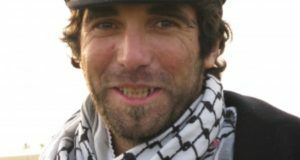 Hamas members then carried out an attack on Gilo from a U.N. sponsored refugee camp just East of Beit Jalla. IDF forces responded by firing into the refugee camp and occupying a family house in the area to survey the area and launch attacks. Families of Beit Jalla and the International Solidarity Movement are calling for a peacekeeping force to come in and separate the sides in the conflict until a just resolution can be reached. The Israeli government under Ariel Sharon has consistently denied the need for intervention, and rejected an offer by the Group of Eight during their recent summit in Genoa, Italy, volunteering to send in an observer team to assess the situation. Instead, the Sharon government agreed to allow several more C.I.A. advisors into Israel. The International Solidarity Movement is a local organization that works with Palestinians to coordinate activities in the West Bank to raise awareness about the Occupation. About 20 Internationals participate nightly by staying in homes most likely to be targeted by the IDF. Since the beginning of the Intifada (Sept. 29th, 2000), as many as 500 homes have been fired upon, some in no apparent response to any thing, and the bombings can take place for the better portion of a day. Families of the most damaged houses are hosting the activists during their stay for the entire week. 5 people have been killed in Beit Jalla, as well as over 100 injured, and over 200 families have been forced to evacuate their houses to avoid Israeli attacks. Up to this point, the area around Beit Jalla has been unusually quiet, but nightly residents closest to the area facing Gilo file out of their homes to a safe distance before any shelling begins.